e-mail addresses. 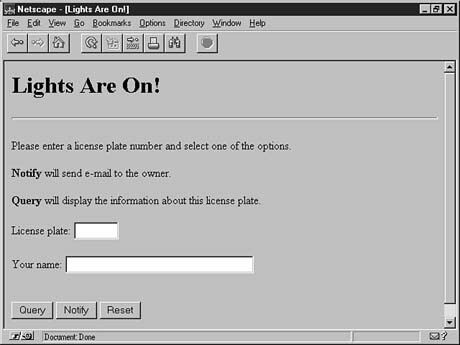 If a person sees a car with the lights left on, he or she can bring up this Web page and send an automatic e-mail notification to the owner of that car. e-mail to the owner. The other submit option is to display only the license plate information. The form code looks like Listing 7.11. Listing 7.11. Subroutine to print a license plate form. This form is shown in Figure 7.6. Figure 7.6. The license plate search form.